Pierson is playing with the Nobbly Wobbly. Ever since I got Pierson, I’ve gone through more dog toys. Nothing annoys me more than buying a $10-$15 toy only to have it torn to shreds within a day. And since Pierson is still young, his chewing is worse than Sephi’s ever was and worse than Maya’s. The Squido is very similar to the Kong Wubba but cheaper. Although it did eventually get the material chewed off, it took Pierson two months of periodic chewing to do it. Keep in mind that Pierson did not chew on this toy every single day. He has several other toys to chew on. This one is a cute toy. It took Pierson four months of periodic chewing to break the Nobbly Wobbly. He only broke one of the pieces so I took it out and threw that piece away. But once that one piece was broken out, it didn’t take long for him to chew the other pieces. Still, four months is a long time so I felt like this was worth the money spent. This is a great toy because you can put food treats in it. Pierson has not so much as dented this toy. He will chew on it for hours until he gets the treats out. I bet the Busy Buddy is as strong as the Kong. But it has a different shape and it is a different color. Busy Buddy has a bunch of other shaped toys to chew from but purple appears to be the common color (whereas the Kong’s common color is red). 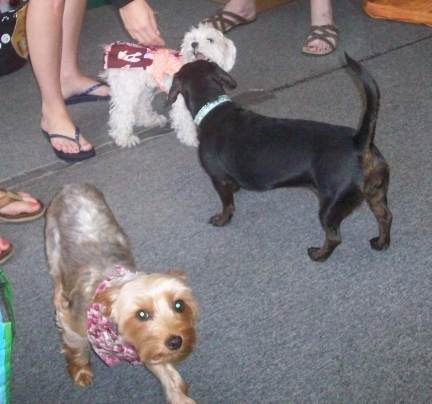 I’ve also talked about the Bottle Buddy dog toys. 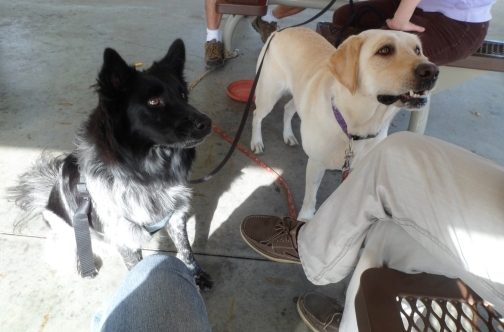 These tended to last a while with Sephi and Maya but Pierson chewed his up within a week. It wasn’t just the bottle inside he destroyed, it was the doggy and piggy casing too. I have to mention the Tuffy’s dog toy once again. Pierson finally managed to chew the stuffing out of the center of the Tuffy’s Octopus. But it still has the stuffing in its arms and all eight arms still have the squeaker. Pierson also has the Tuffy’s Gear. He has had it for at least six month now, perhaps longer since I think I bought it for him when I brought him home for the first time in January. And the Tuffy’s Gear is still completely intact. As far as plush dog toys goes, I will never ever again get anything but Tuffy’s. Pierson’s Tuffy’s Gear dog toy. 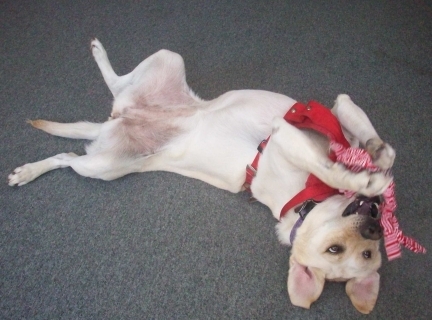 If you are looking for some indestructible dog toys, be sure to check out the Tuffy’s and others. My dogs are well-entertained with these toys and I save money. Keep in mind, though, that each dog is different. Some dogs can chew through anything! If you’ve been reading my blogs you know that my dogs are very smart, especially Pierson. But I admit, I am terrible at training my dogs to walk properly on a leash. I’ve tried several humane techniques with my exuberant Lab Maya and some have worked to a point. She was doing fairly well until I got my dog Pierson. Pierson goes absolutely nuts when he sees another dog so Maya has taken up barking excitedly whenever she sees another dog. Now I have to walk them separately and train all over again. I came across a great blog post that mentioned most issues with dogs can be alleviated with proper exercise. The logic is if your dog is getting enough exercise, they tend not do get overly excited. This make sense, but not for my Maya. When I commented as such on the blog, another commenter mentioned that it was because I wasn’t using the right techniques and that Maya’s issue could be resolved within a few days. 1. It is cheating. I think far too many people use a shock collar as a shortcut to training. People who don’t know how to train a dog or who don’t want to take the time to properly train a dog use the shock collar shortcut. Now, I must admit that the person who recommended the shock collar only recommended it as a last resort since I have tried all other methods. If the decision to get a shock collar is because all other methods have failed and it is a danger if you can’t get your dog to walk properly on a leash, then perhaps I can see it. But it is not a danger for Maya. I can live with this issue and would rather continue to try to resolve it the humane way. 2. It takes the joy out of training. 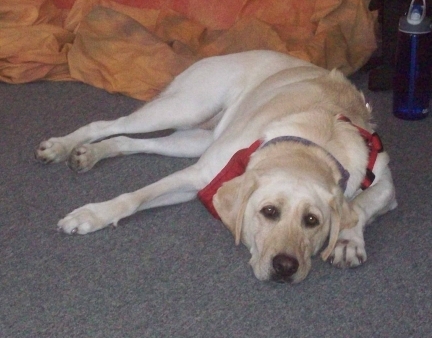 Maya is a sweet dog and she loves training time (mostly because she gets treats). I love training time too because I enjoy watching how enthusiastic she is about it. Training time is our bonding time. If I start shocking her in training, she will dread that time. 3. It tends to only work when the dog is wearing the collar. I’m going to admit another fault of mine. I grew up in the old school form of training. Most of my earlier dogs learned this way. It wasn’t until Maya was about a year old that I learned more humane methods. So for a few months in Maya’s early life, I used a pinch collar. It worked great. However, if I walked her without the collar, she was naughty all over again. If I couldn’t get her to walk properly on a leash without the pinch collar, then I wasn’t really training her. 4. It can turn a dog to aggressive or submissive. This does not happen in many cases, but it could happen. I’ve heard stories of dogs suddenly turning aggressive because of the shock collar. Perhaps the person using the collar didn’t use it properly or perhaps it was the dog. Every dog is different. A shock collar can also make a dog overly submissive. I can see this happening with my sweet Labrador. Maya is very sensitive. Yes, I’ve raised my voice at her a time or two. I’ve never raised my hand to her but when I yell she acts like I am going to beat her. Can you imagine how she would react if I shocked her? Poor Maya! So what are the positive points of using a shock collar? Quicker results, easier, may be able to help if all other methods fail. But when I weigh the pros with the cons, I see a great imbalance. For me, reason #2 alone far outweighs everything else. If you don’t believe me, just check out some of my videos on YouTube – http://www.youtube.com/user/naturebydawn/videos?flow=grid&view=0. I have quite a few videos of my dogs doing tricks and you can see how much they’re enjoying themselves. Do you think Pierson would be having as much fun jumping through that hoop if I had trained him with a shock collar? I think not. If you’ve considered using a shock collar, please do your research and don’t be tempted with the quicker and easier results. Train Humane Day isn’t just about treating your pet humanely, it’s about learning the overwhelming benefits of not using harsh training methods. For more information on this special day, visit http://trainhumane.unitedcp.org/. I could go on and on with this. It is so much fun. 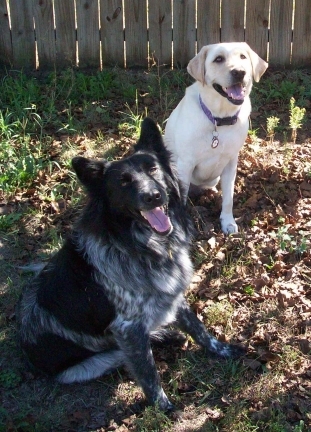 Can you think of other dog names that might correspond with their color? Fall will be here officially on the 22nd. Maybe it feels like fall where you are, but it sure is hot here! In fact, the brown leaves in this photo are the leaves that died from the heat this summer. Even though it is still hot, there are some signs of fall. 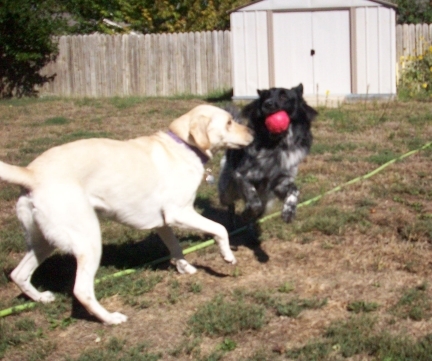 Check out my dogs Maya & Pierson as they celebrate the upcoming season by having a ball. Pierson & Maya on a bed of fallen leaves. Maya & Pierson having a ball! Pierson’s got the ball… and he actually brought it back this time! 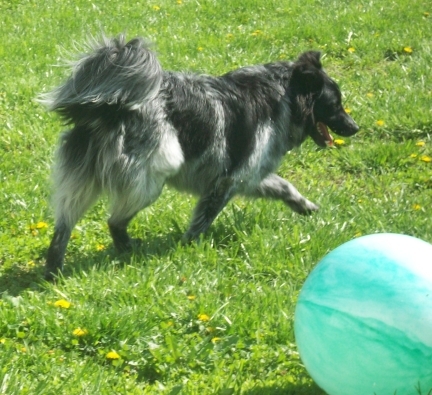 Here comes Maya with the ball! 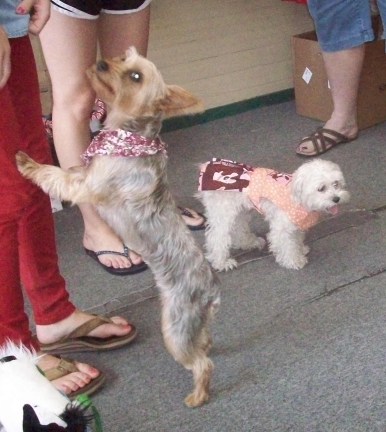 For more great Wordless Wednesday photos, click to visit our Pet Auto Safety Blog for the blog hop. 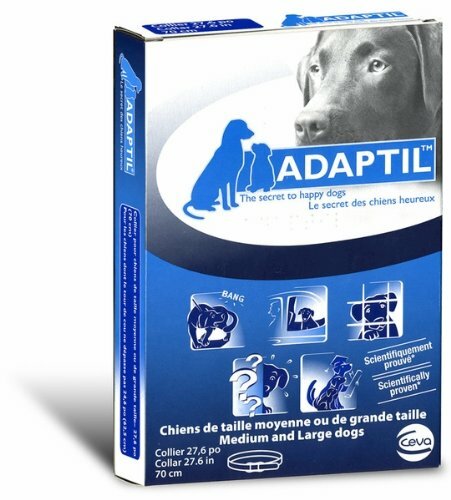 Adaptil makes a collar which helps to reduce stress in dogs. This stress can be related to travel, loud noises like thunder, and new surroundings. 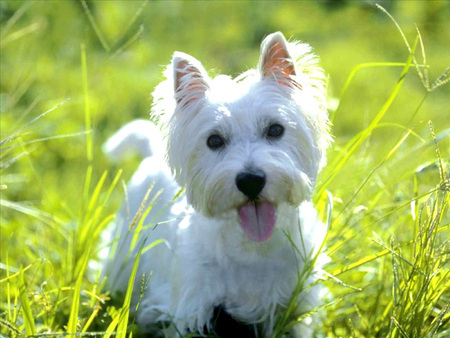 It works by releasing a laboratory created pheromone which is based on the pheromone released by nursing mother dogs. So a puppy with his mother is less likely to experience anxiety due to not only the mother’s presence but also the pheromones she releases. Can a synthetic pheromone work when mom is no longer around? I’ve heard the Adaptil collar helps many dogs be more relaxed and comfortable but may not help all. Well, I think my dog is one of the ones it did not help. 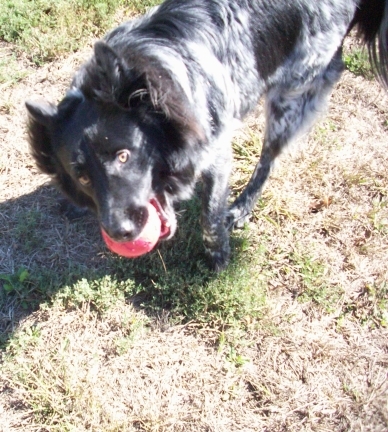 Pierson is an Australian Shepherd / Border Collie mix. 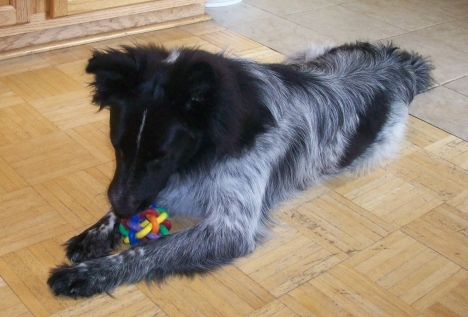 He is a fantastic dog – smart, lovable, and mostly well-behaved. I’ve had him for about 8 months now. He came with several issues. But over that 8 month period, most of those issues have been worked out. The one that hasn’t is his aggression towards other dogs. He walks well on a leash until he sees another dog where he gets all worked up and goes crazy. I had hoped Pierson’s situation was similar enough to the other stressful situations Adaptil says it helps. The synthetic pheromone helps reduce anxiety in dogs with loud thunder and noises, so why not the anxiety produced by being around other dogs? The package did not specifically state it would help with this type of situation, so obviously there is more involved with Pierson’s behavior than just simple stress. Perhaps it is the natural suspicion of his breed mix. 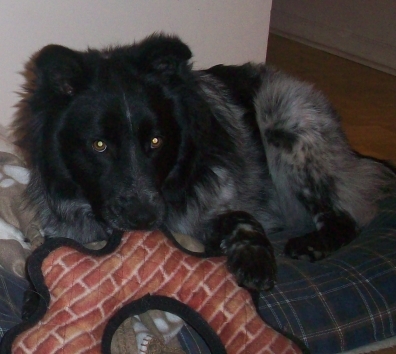 Or he probably wasn’t socialized when he was a pup (before I got him). Or maybe he had a bad experience with other dogs as a stray. Despite my lack of success with the Adaptil, I’ve heard too many positive stories to dismiss it. Perhaps it works better in the specific situations it describes – loud noises, traveling, new surroundings. The product is not that expensive so if you have an anxious dog, it is worth a try. This is our friend Dougie. 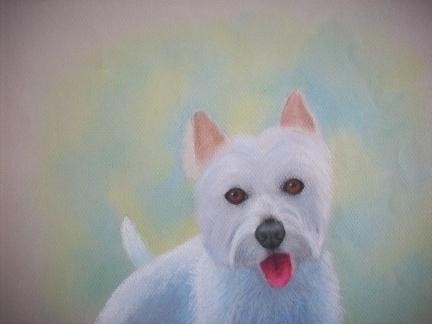 He is a West Highland White Terrier, or Westie. Isn’t he adorable? Rough sketch. Notice I changed his back and tail a bit. Finished sketch. I think his eyes are too far apart and not quite big enough so I make sure to correct this when I transfer the sketch to the pastel paper for the finished piece. I traced the sketch with the big eyes closer together modification onto acid free pastel paper. Then I completed the background. This was my second attempt at a background. 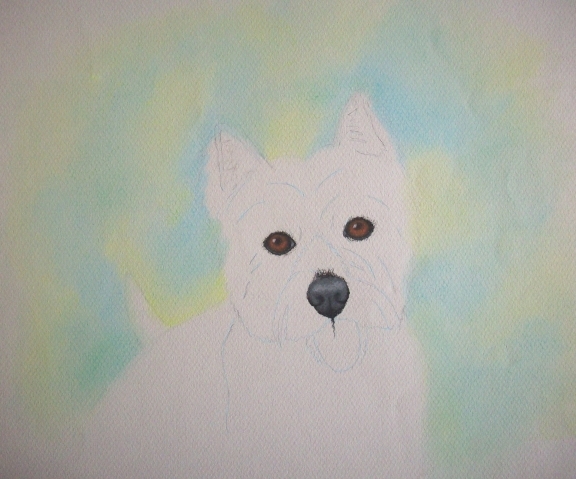 the first one did not come out well so I threw it away and started over. Next I worked on the hardest, most important, and the funnest parts – they eyes and nose. 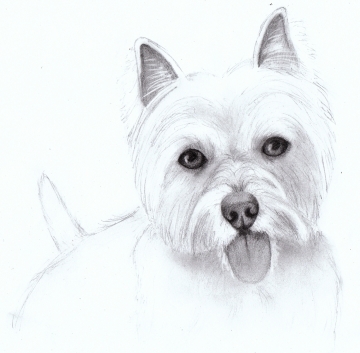 If the eyes are not right when drawing people or animals, the rest of the artwork won’t look good either. 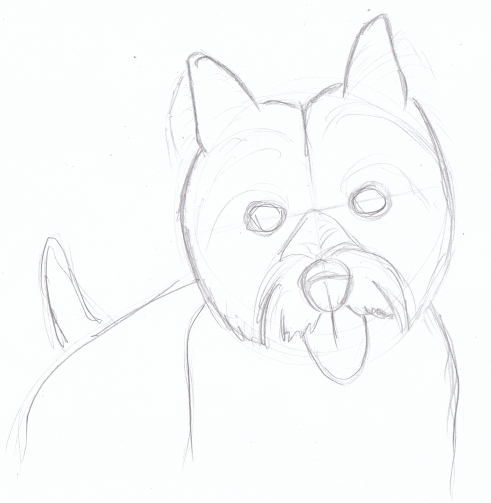 Then I did Dougie’s body and drew in his cute pink tongue. 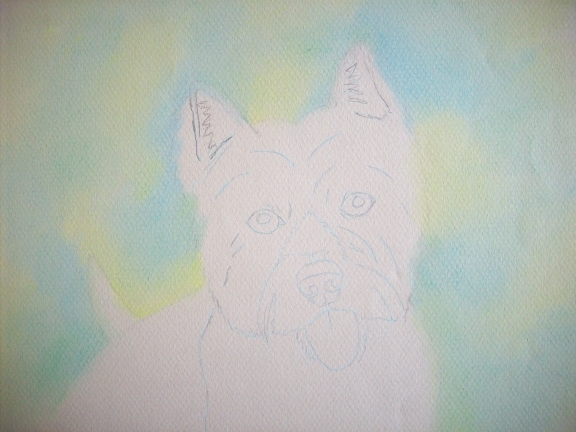 Check out my other artwork in progress pages at Nature by Dawn.com. 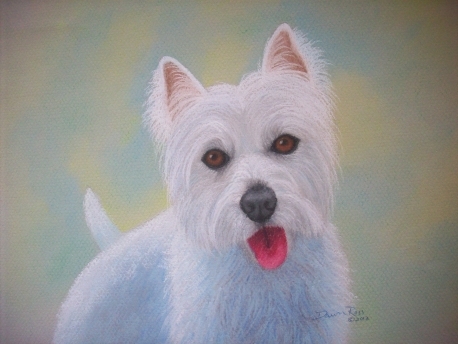 If you would like me to do a pet portrait of your dog or cat, email me at naturebydawn@aol.com. 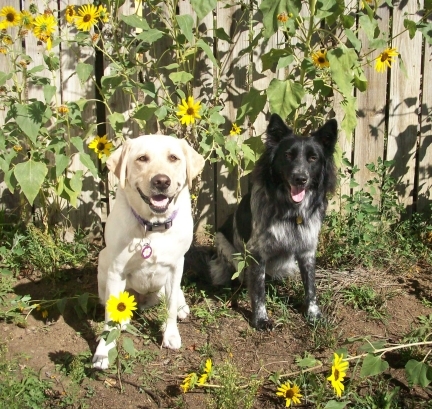 For more great photos of pets, visit the Wordless Wednesday blog hop by clicking HERE. I’m cute and a lot of fun but I can be trouble if I get bored. 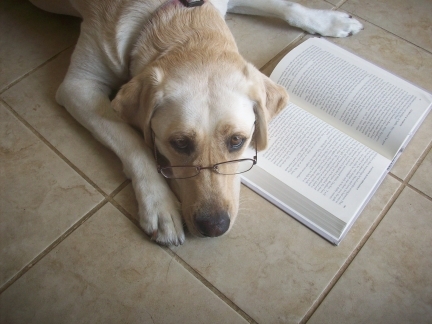 I read a great article on WayCoolDogs.com about how smart dogs can be a lot of work. 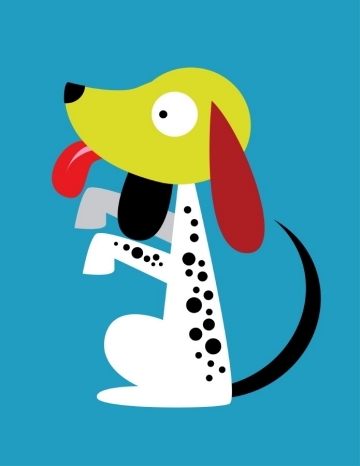 Many people are drawn to smart dogs because of all the things they daydream a smart dog could do for them that an average dog can’t. Seriously, we see those assistance dogs, police dogs, or agility dogs that can do all sorts of cool things and we think, “Wow! 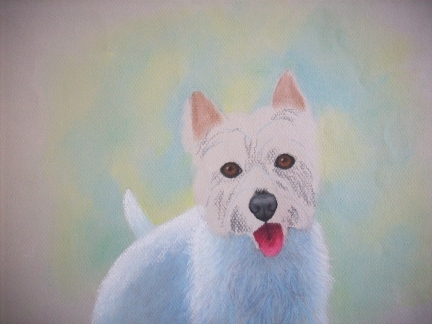 I wish I could have a dog like that.” But we really don’t know what we might be getting ourselves into. Who wouldn’t want a dog that could learn to open the fridge and get us a beer on command? Neat trick, right? But do we really want a dog that can figure out how to open the fridge? It won’t be long before this really cool dog could be helping himself to other things in the fridge. And a smart dog like that might figure out how to open other things, like cupboards or even your front door. I have a smart dog. Actually, I have two smart dogs. It is not enough that I need to take them for regular walks. I need to keep them entertained as well or they might cause trouble. Well, actually only one dog might. Maya can be a bit of a couch potato. But Pierson is constantly looking for stuff to do. I could take him for an hour walk and play fetch with him for another hour and it will still not be enough. So how can I keep him out of trouble? Pierson also partakes in regular training. I’ve had him eight months now and he already knows every trick Maya knows plus one or two more. Most tricks are easy, but now we need to start working on things more complex. He loves to learn and I try to take advantage of that as much as possible. Pierson likes to play games too. We play hide-and-seek sometimes. I hide and he tries to find me. He is getting better at it. And he is learning the “Find It” game (mentioned last month). 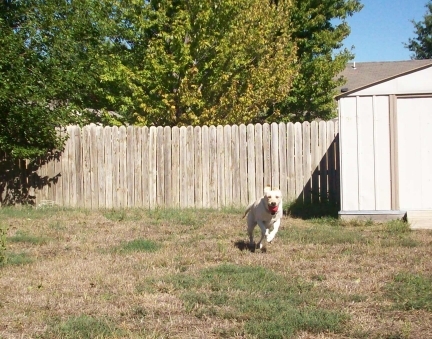 Other games we play are fetch, he is learning to catch a frisbee, and one of these days I’d like to teach him agility. Having a smart dog is fantastic. I’m so proud of how smart my boy Pierson is. But he is also a lot of work. What would he be like if I didn’t spend so much time exercising, training, and playing with him? Well, he might learn to help himself to the cupboards or fridge. He might decide that chewing my stuff is entertaining. He might make a game out of taking my things and hiding them. 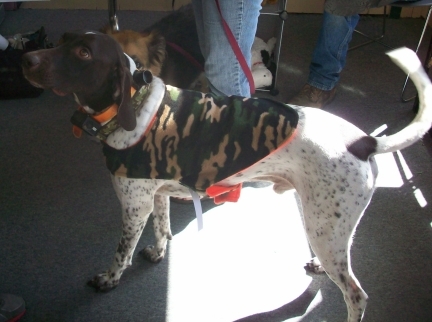 Or he could decide that he needs to take the rabbit hunting to the next level and dig out of the yard to track them down. There is a lot to consider before getting a new pet. How intelligent they are and how much time you have to dedicate to them is one of those factors. 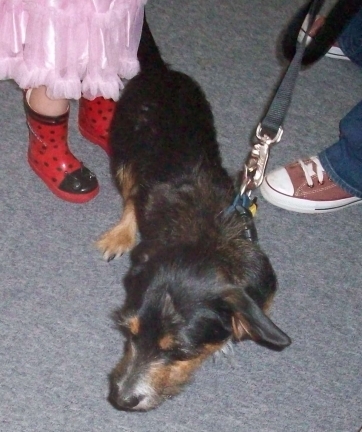 If you are considering a smart dog check out this article from WayCoolDogs.com called, “Beware the Smart Dog“. I don’t bake often. But because Pierson likes to eat dog poop, I had to come up with a solution. I didn’t want to buy something if there was a natural remedy. So I did a little research and found that if my dogs eat a little pumpkin and/or pineapple juice, it might deter Pierson from eating the now-flavored poo. I found a great recipe online and modified it to add a little pineapple juice and replace some of the wheat flour with oats. I also chose not to add salt. I brought some of these treats with me when we all went on a picnic. Has this stopped Pierson from eating dog poop? Honestly, I’m not sure because I still consistently pick up after them. Perhaps one day I will miss some and be surprised to find Pierson didn’t eat it. Bake for about 40 minutes at 350 degrees F. The recipe I based this from is HERE. 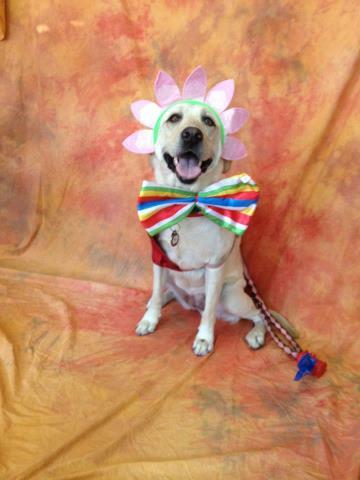 For more great pet photos, check out the Wordless Wednesday blog hop HERE. 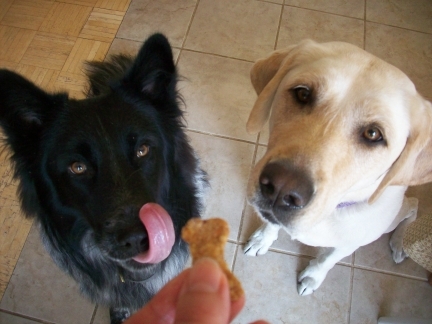 We have been given the opportunity to try some homemade dog treats by Lacey’s Barkery. Lacey is a beautiful Boxer whose family was concerned about how most dog treats in stores are made in China and not regulated by the animal FDA. With all the recent scares about dogs getting sick and even dying from such pet food, Lacey’s family was inspired to make their own dog treats. They really are delicious. I tried them for myself. Hey, I’m not about to feed something to my dogs that I am not willing to eat. The treats are chewy instead of crunchy. Me personally, I prefer my dogs to eat crunchy because it is less likely to get stuck in their teeth. But that doesn’t take away from the flavor. 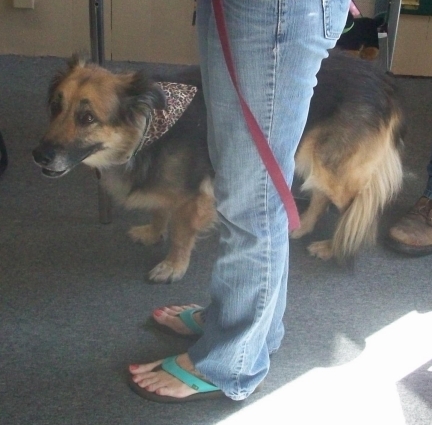 Besides, if you have an older dog with bad teeth, softer may be best. We only had the opportunity to try the peanut butter bacon dog treats. 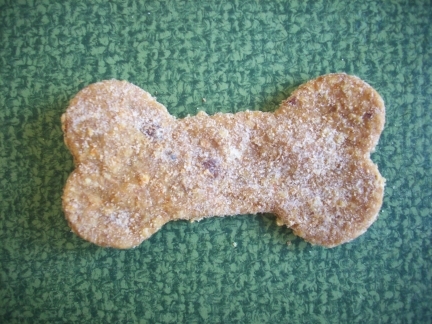 But Lacey’s Barkery has other great dog treats too. 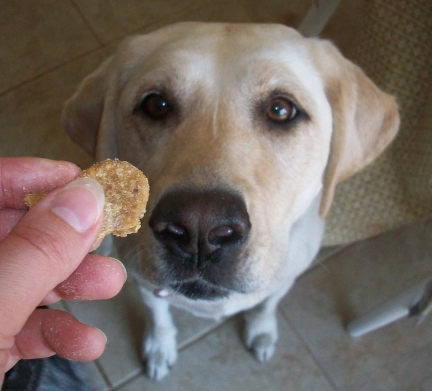 They have oat treats made with banana, blueberry, sweet potato, carrot, or carob. 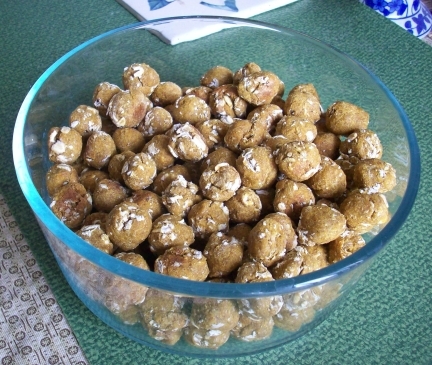 And they also have dehydrated sweet potato, banana, or apple treats. These dehydrated treats are organic. Another great thing about these treats, if you use certain promo codes indicated on their site then 10% of your purchase will be donated to an animal charity. So check out Lacey’s Barkery and give them a try! We were not paid for this review.